When I returned, a stronger pool of light fell onto the tabletop giving a more dramatic sense of mood. 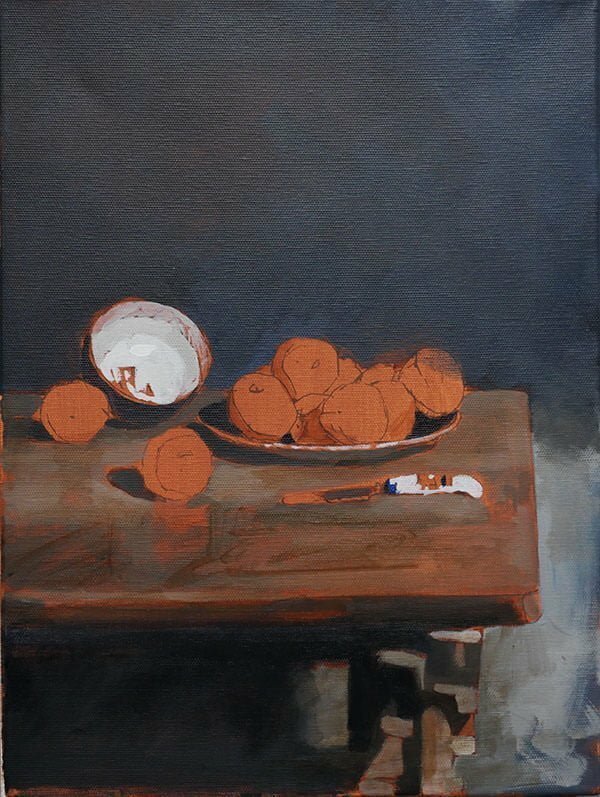 It now felt more like a classical Dutch still life, I loved how the apricots had taken on a new luminosity due to the shadows behind them and I wanted to capture it before it disappeared. 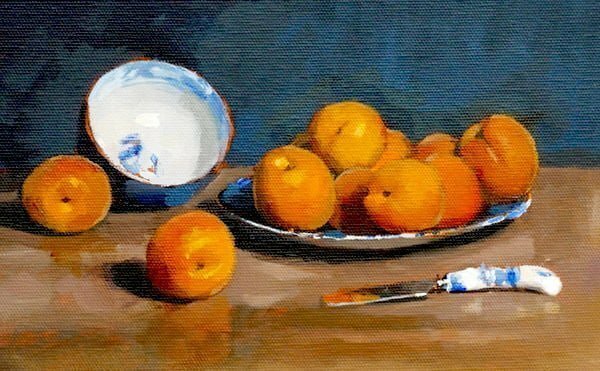 I quickly began to move things around, swapping the background for an intense navy and piling in with more apricots. It already looked like a painting and I needed to paint it. So instead of filming and editing what I should have been doing, I found myself painting different groups of apricots furiously for five days solid, schedule firmly out the window. 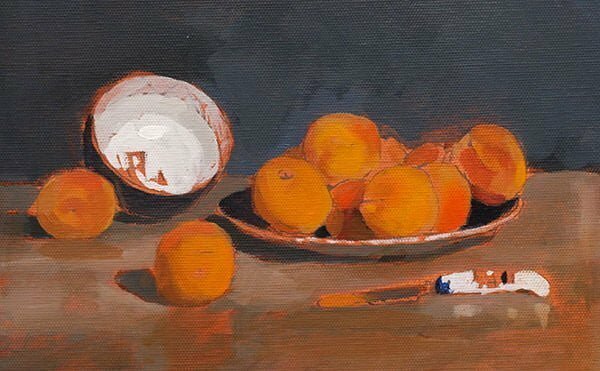 I’ve always had a soft spot for lemons (we paint some of those too) but the apricots have proved surprisingly enjoyable to paint, both for the course and my own practice. You can create a realistic rendering of the form with just a couple of colours. 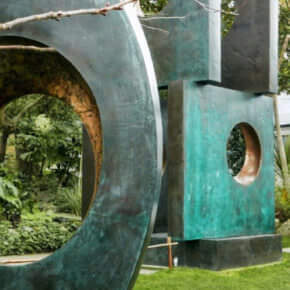 Cutting them in half and revealing the dark brown of the stone gives you a strong contrast between lights and darks. They have a less uniform shape than oranges. They have a variety of hues, from yellows to oranges to reds, all within the same scene. Apricot jam and Wensleydale cheese sandwiches are my Dad’s favourite. So the painting below is one of the pieces I’ve been working on when I should have been filming the new course, but I thought it might be of interest to see how the painting came together. 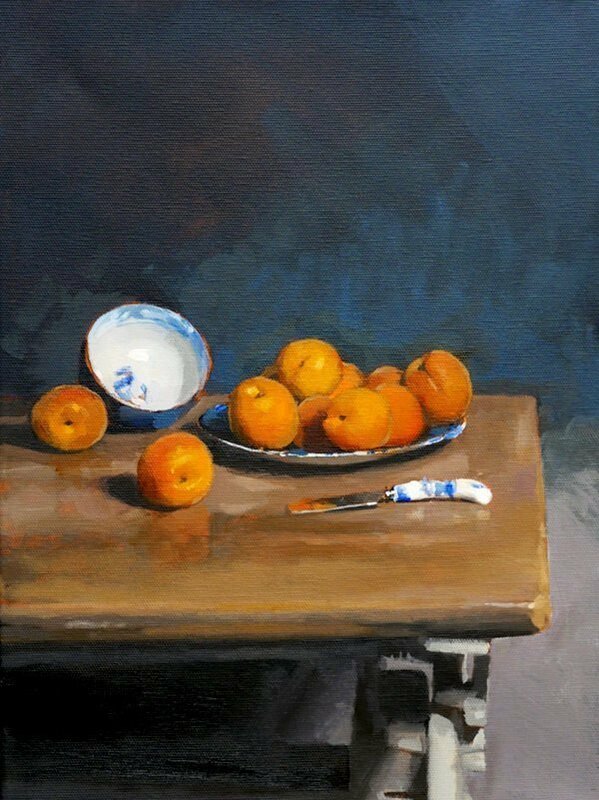 The scene is a plate of apricots with a small porcelain bowl on an old wooden mangle that Vanessa picked up at an auction. There is also a little porcelain handled-knife that I seem to be obsessed with painting at the moment. 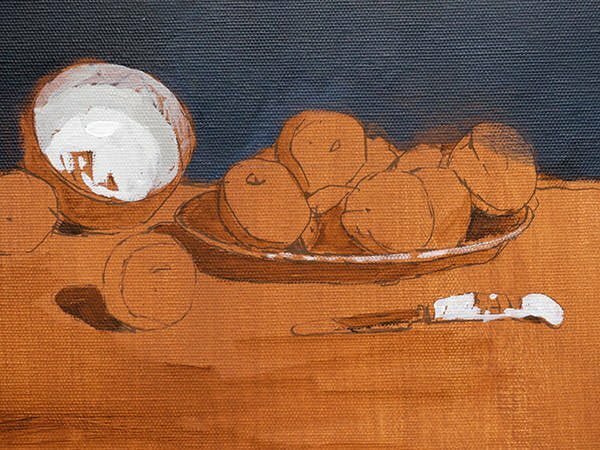 I prepared the canvas with a coloured ground mix of Burnt Sienna, Titanium White with a touch of Cadmium Red. I arranged the scene on the table into 3 main groups. When I approach a still life setup, I’m always trying to vary the shapes and spaces of the contour line around the edges of the subjects. 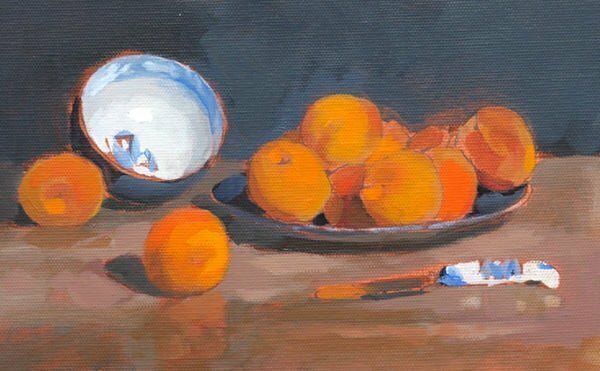 I continued to work within an orange and blue complementary colour scheme for this piece, so each of the three groups has both blue and orange elements within. I used a Burnt Umber acrylic marker and a thin wash of Burnt Umber and Burnt Sienna diluted with water for the drawing out and a hog brush, usually used for oil painting. The bristles can go a little splayed when submerged in water for a long time but I like the broken edge you get with this older brush. Here you can see how when more water gets into the hog bristles, they lose their shape and start to spread outwards. Not always a bad thing! 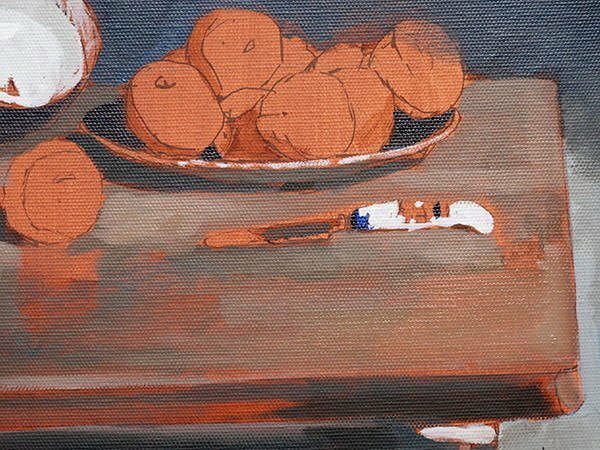 Detail: At this stage, I’ve tweaked the colours and transparency, a little more Burnt Umber for in-between the apricots on the right and a thinner watery wash of Burnt Sienna on the surface of the apricots. 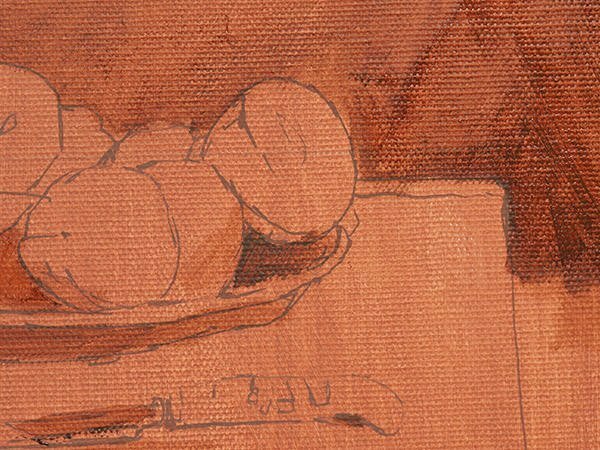 I dilute down a mix of Burnt Umber and Burnt Sienna, a lovely dark red-orange with water and scrub it into the canvas surface. I go a little darker to the top left because I know this will be a lot darker in the final painting. I also block in the cast shadows of the apricots and under the plate, I want to keep the sense of the central shape of the apricots being illuminated by a spotlight. I now mix a dark inky black using Burnt Umber and Prussian Blue Hue. 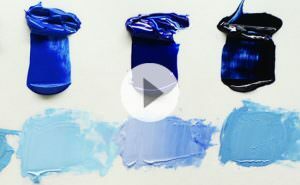 Prussian Blue has a subtle turquoise tint to it and I want this cooler blue for the background. I work around the edge shape of the bowl and the apricots so I can judge my drawing. 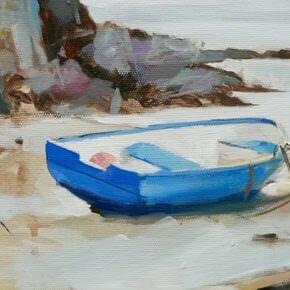 Viewing the scene from a distance at this stage (stepping back a few feet from the canvas) can really help you to get a sense of the overall impression before too much detail has been added. I block in the shadow under the mangle and add some Titanium White and a little Burnt Umber to warm the mix and paint in the tone on the right-hand side. Now I wanted to establish my overall tonal range, so I bring up the two lightest areas of the painting. I’m using grey mixed from a little Burnt Umber, Prussian Blue Hue and Titanium White and a diluted wash of Titanium White. Now I can start to scrub in the table top surface, using a mix of Burnt Umber cooled with a little Prussian Blue Hue and Titanium White. 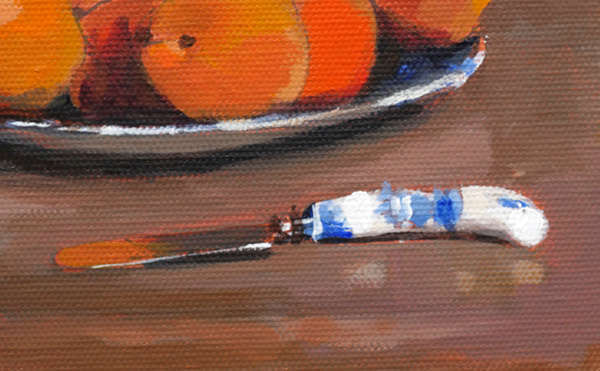 I’m varying the consistency of the paint so in some areas there is a warmer feel, especially under the apricots. I’m keeping the warmer underpainting to give that illusion of a reflective surface. You can also see a few little dashes of the contrasting blue in the knife handle and within the darker shadows on the plate. Now I’ve got most of the canvas blocked in, I can see how the colour balance is working and the tonal range of the main subjects as a whole. 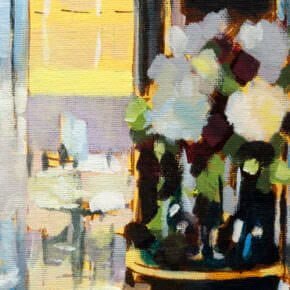 As I work through a painting, I’m always reassessing the balance between the different elements, bringing the piece all up at the same time, rather than completing one element at a time. 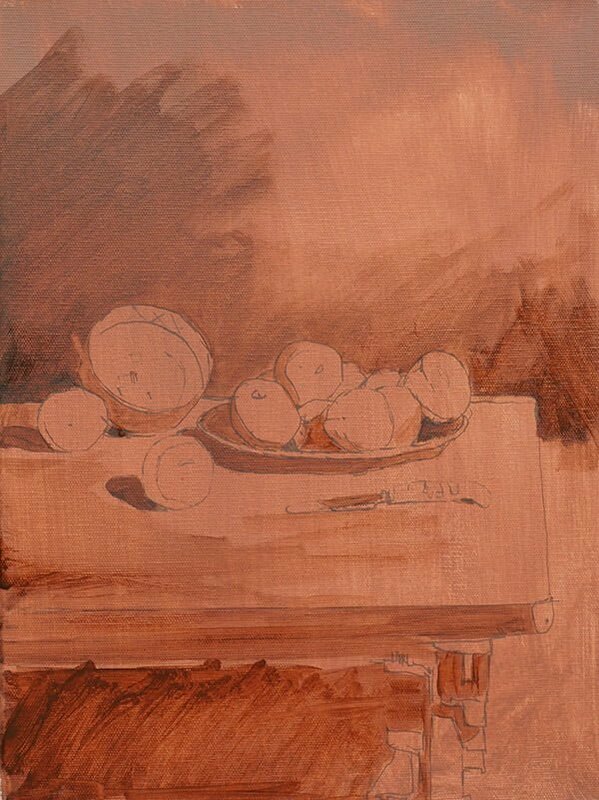 Using Cadmium Yellow Light and Permanent Alizarin Crimson, I mix orange and begin to work along the form shadow line of the apricots, covering over the initial pen lines and looking for the differences in tone. When I cool or darken the colour in the shadows I’m using either Burnt Umber or Prussian Blue Hue. I add a little dash of Cadmium Red to give a stronger base and a more saturated colour for certain areas, so I can better judge the more subtle surrounding hues. The apricots are quite close in value, so the colour differences can help to separate them out. Before I paint any more, I add Ultramarine Blue to the palette and block in the pattern on the bowl and the knife handle. With this brighter blue in, the orange hues of the apricots will pop a little more. 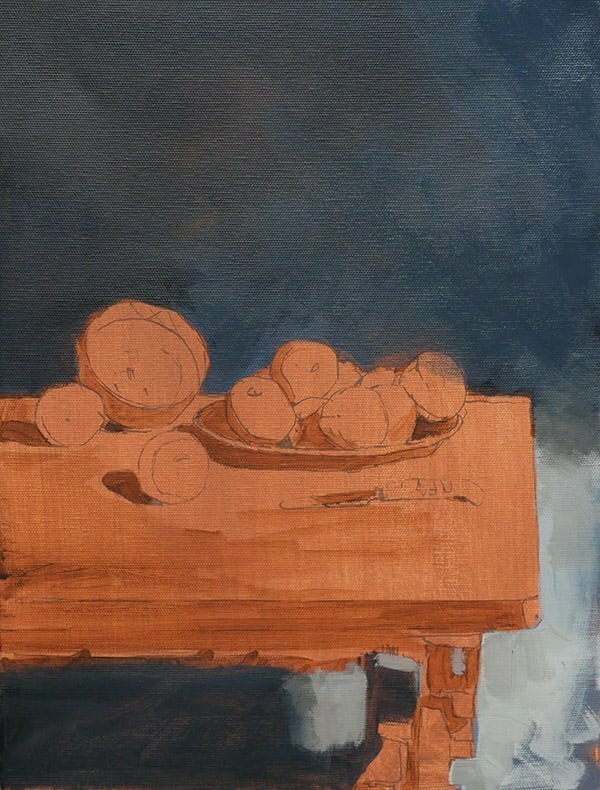 I can then start to push the intensity of the oranges, looking for a range of tonal values as the light changes across the form. 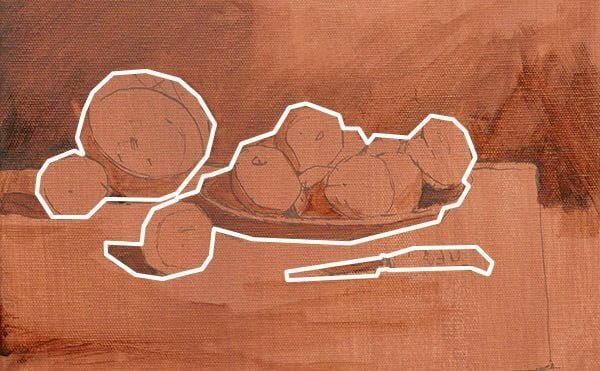 By adding the highlight reflections you get a greater sense of the light source and I refine the colours on the knife and the bowl. I really like the painting at this stage and there is something really enjoyable about the freshness of the marks. 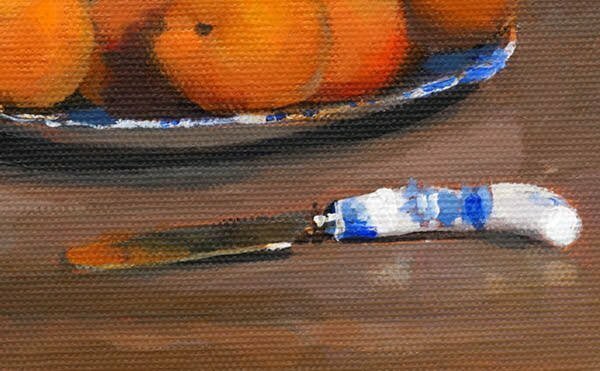 Here’s a detail of the knife, you can see the reflection of the apricots in the top of the knife handle is the initial ground colour. The subtle white glazes on the surface under the knife, reveal the sheen of the table surface. Notice how the edges of the reflections are kept really soft. I now look for the little dashes of light around the edges of the fruit, judging the balance between the different shapes in the arrangement. 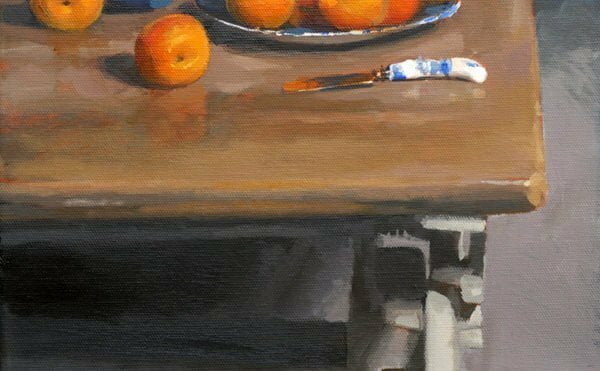 I wanted to keep the central element of the fruit slightly separate to the front of the mangle, so I start to bring up the value to the front of the wooden surface and add few glazes with Raw Sienna, so it has a lighter, more yellow hue. I also change the hue of the background on the bottom right to a warmer neutral colour and paint in the metal work using a mix of Raw Umber, Titanium White and a little Raw Sienna. When will the new course be ready? Hopefully, the end of May. 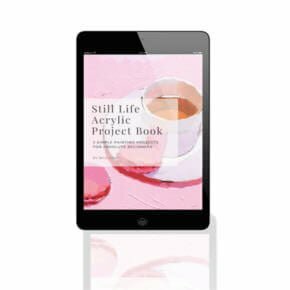 We look at 3 different still life paintings, alongside colour theory exercises so you can understand the properties of paint, how colour works in paintings and learn the foundations of colour mixing and theory. What if I want to get started today? 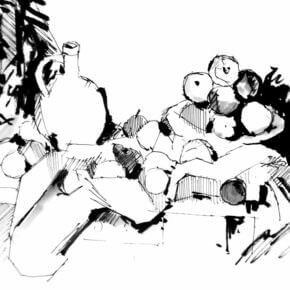 If you want an introduction to form and cast shadows, have a look at the still life e-book. If you want to catch the original version of the beginner’s colour mixing course for 50% off you can grab it here. Love this! Thank you for the detailed WIP. So helpful to me at this very moment because of a piece I am doing! Cheers Honey, so pleased to hear it. Will you’re brill! Honestly, I await your posts with great enthusiasm, I love the fact that you share these details with us and most importantly, I pass it on. Great advice deserves to be shared and it’s good to know that your words are spreading! You’re very kind Jenni, that’s much appreciated. Thank you, Will! This definitely caught MY eye, because orange (and yellow) are my favorite colors, and I particulary like them contrasted against nice blues and purples. This is one I would definitely like to do and then hang it in my kitchen!!! You do such a wonderful, professional job of laying out a lesson like this. I will share this with my granddaughter who is a fine arts major in college this year! Glad you found it of interest Martha, hope you granddaughter enjoys it. I can see why this bowl of apricots derailed your schedule. Truly beautiful your rendition of them. Love the lighting and the placement of the bowl and ceramic knife. Thank You for sharing your process. Thanks very much Lela, very much appreciated. Thanks very much C-Marie, yes Prussian Blue in oils is a particularly lovely paint, hope you enjoy experimenting with it. THANK U FOR THE STEP BY STEP DEMO AND THE COLORS U USED HELP ME GET IDEAS ON HOW I CAN ADAPT MY PAINTING. BY THE WAY, I LOVE LEMONS AND APRICOTS. I LOVE LEMON CURD ON MY TOAST. FOR SOME REASON, I HAVE TROUBLE USING A SOFTER HAIR BRUSH. I LOVE WHAT U SAID ABOUT THE BRISTLES SPLAYING. I LIKE THE ROUGHER TEXTURE AND DEFINITION INSTEAD OF A SMOOTHER LOOK. Lemon curd on toast is an excellent choice Cheryl! especially a good homemade one. Pleased you enjoyed the lessons. Cheers Christina, thanks very much. That’s a well structured and helpful demo Will. Thanks. It is also good to get a bit of thoughtful insight into the tricky business of still life composition. Thanks Leonard, glad it helped. Yes, working in smaller groups of objects can often help to guide the overall effect of your composition. I did not understand if you are going to make a video how to paint those apricots or it will be something new in May? Anyway I look forward to those video. 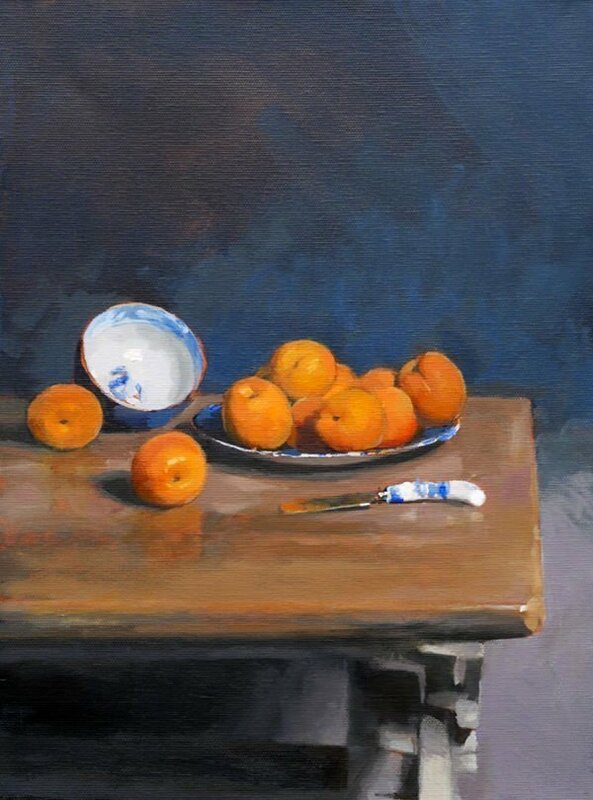 Hi Irina, I’ll be making a colour mixing course that includes a lesson on how to paint the lighter three apricots with the pale blue background. 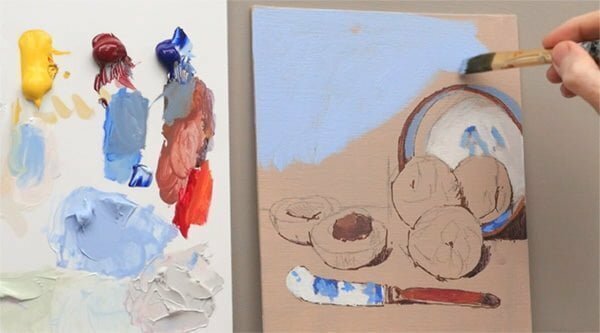 After reading more closely your article about painting apricots I realized that video will be something different not apricots. Sorry for misunderstanding! Your painting is really very lovely. I would like to paint it too. Colors are beautiful. As always I like your paintings! 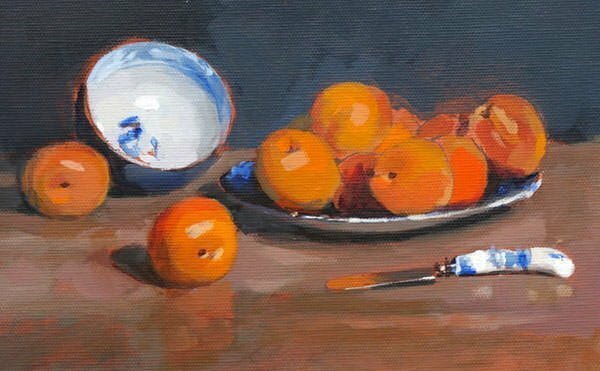 Hi again Irina, there will be a lesson on apricots and a few other still life setups that look at other complementary colour schemes. Hi Will, Beautiful painting and always excellent step-by-step instruction. 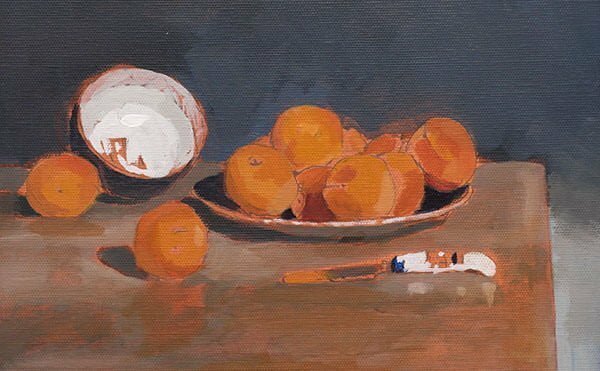 I’ll buy some apricots and make an easier still life arrangement… I’ll try acrylic and oil. Yours looked so fresh that makes me take one and enjoy eating it… As a child I climbed in the trees and eat the apricots as I picked it from the brunches…… Wonderful time. Hope I could make an “original” painting… Have a wonderful day and productive painting time. Thanks very much Maria, hope your setup goes well. How neat and methodical! 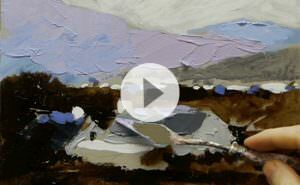 A pleasure to see the process of how your painting develops. 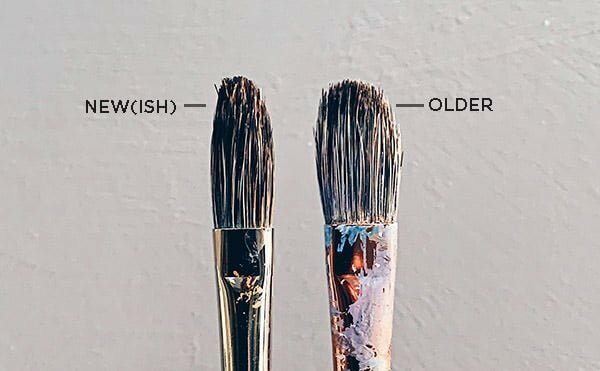 Makes me want to be less impatient when I paint. Thanks taking that call on your schedule. Really glad you enjoyed it Pallavi. As a newcomer to Art I really appreciate your great tutorials and clear instructions. 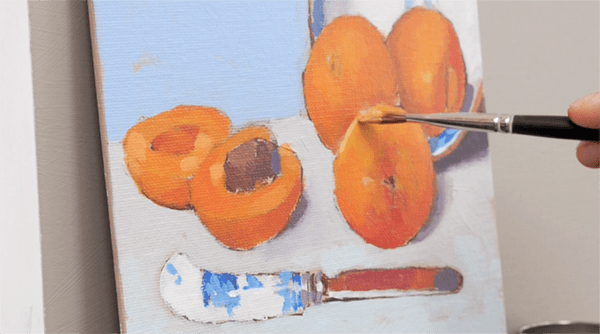 The apricot demo uses fantastic colours and I can’t wait to have a try. My pleasure Margaret, so glad you enjoyed the lesson. 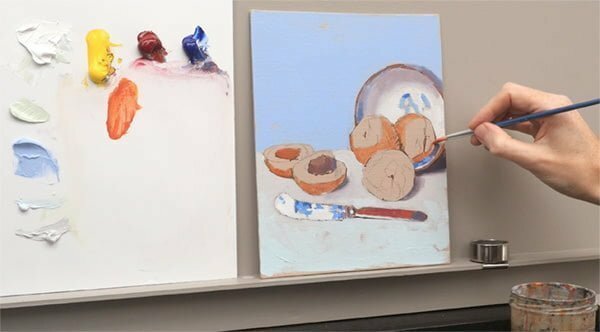 Gorgeous painting and wonderful tutorial as usual. Thanks so much for sharing your knowledge on how to paint. A lot of info to absorb at the moment but I appreciate it. Thanks Karen, pleased you found it helpful. I have been receiving your newsletters for some while now and I feel newly inspired every time one arrives. I have been silently appreciating your work! That’s great to hear Pamela, so pleased you’ve been enjoying the articles. My pleasure Jennifer, so glad you enjoyed it and your drawings are going well. This made my day! Thank you for so generously sharing your talent with the rest of us! Thanks very much Heather, my pleasure. Thanks Will. I always enjoy your techniques and creative work. Thanks Will for another great post. You are the best tutor and I wish I could follow live lessons in your studio but since this is not possible I try to be informed from all your helpful lessons and posts through the internet. Best regards. 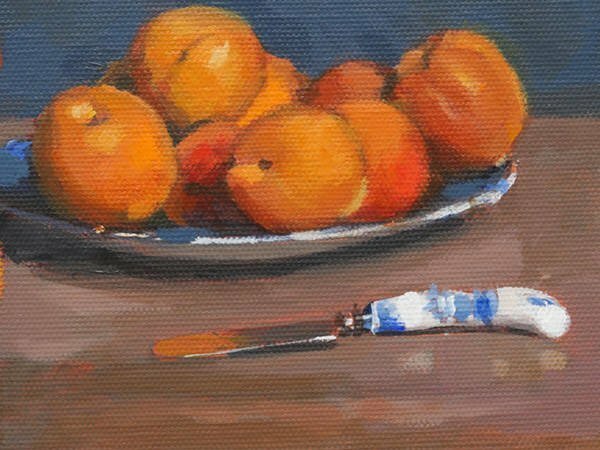 What a lovely, luscious painting of apricots! I love the deep blue/green background, too. Glad you were distracted. Thank you, Will. Cheers Oksanaa, so glad you liked it. Thanks Will. 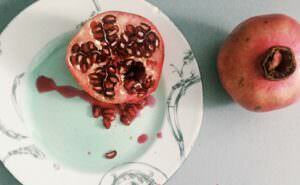 Another excellent tutorial and on one of my favourite fruits! Thanks so much Peter, hope you’re keeping well. Thank you for another timely, colorful post – just what I needed! Replace those apricots with some red rock desert, and you’d be painting a Moab landscape! So pleased you enjoyed it Shari. I just did this painting and I am very happy with it, thanks heaps. I bought your acrylics beginner and portrait course late last year, they are great and I learned a lot from them. I tried very hard to imitate your brush strokes which look effortlessly, but mostly failed. Can you please upload an article on basic strokes if it is ok? You already have a lot of free but very valuable content here, I feel it is too much to ask. Thanks Ran, really pleased you found the courses helpful and good to know a basic brushstroke lesson would be helpful. Will, I’m so happy I found your website and I’ve been obsessively reading and watching everything I can from you! Even though I studied art and have taken classes at other colleges, no one has explained painting so well or made me so excited about the possibilities with my work! You are such a positive and interesting person— you inspire me not only to paint but to really enjoy life. What a gift! Thank you so much!! Hey Bethany, that’s fantastic to hear. So pleased you’ve been enjoying the courses and finding them easy to follow. Have a great week! Always good to see your posts. Refreshing and inspiring. Thanks. My pleasure Eduardo, hope you’re keeping well. Will Kemp, I purchased your course on color mixing. In doing so I was somewhat worried that it wouldn’t offer anything I couldn’t find for free on YouTube. I was both pleasantly surprised and totally blown away. It is exceptional! Thank you, thank you! That’s fab to hear Jody, so pleased you’ve been enjoying the colour mixing course.